Siena is a city in Tuscany, Italy. It is the capital of the province of Siena. The historic centre of Siena has been declared by UNESCO a World Heritage Site. It is one of the nation's most visited tourist attractions, with over 163,000 international arrivals in 2008. 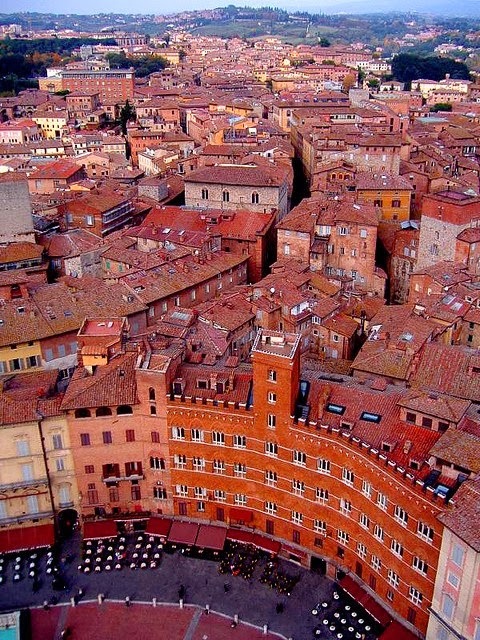 Siena is famous for its cuisine, art, museums, medieval cityscape and the Palio, a horse race held twice a year. The Siena Cathedral (Duomo), begun in the 12th century, is one of the great examples of Italian Romanesque-Gothic architecture. Its main façade was completed in 1380. It is unusual for a cathedral in that its axis runs north-south. This is because it was originally intended to be the largest cathedral in the world, with a north-south transept and an east-west nave. After the completion of the transept and the building of the east wall (which still exists and may be climbed by the public via an internal staircase) the money ran out and the rest of the cathedral was abandoned.